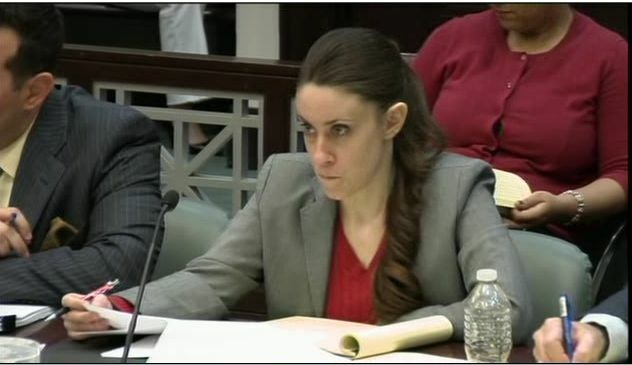 Orlando, FL- Exactly three years to the day that Casey Anthony met her former boyfriend- turned- informant Anthony Lazzarro, and whom many observers believe was the reason Casey Anthony allegedly murdered her daughter Caylee Marie Anthony, the trial of the State of Florida v Casey Anthony begins. Ironically, it is also the 3rd anniversary of the day a woman accused by Casey, as Zanny the Nanny, Zenaida Gonzalez, got traffic tickets within hours of Casey’s best friend Annie Downing, brought to you courtesy of www.blinkoncrime.com. Talk about a prophetic date. Instead of a Rapture it is more like a Rupture. The road to perdition has never been accompanied by lip service to an ideal. Someone is not telling their client that Florida has gotten pretty bullish on sentencing it’s young murderesses to death. Tiffany Ann Cole, Margaret Allen, and Emilia Carr all have an impending date with a needle, and the ladies of lechery have been sentenced in the last 4 years. In fact, the second most recent female resident on Florida’s death row, Emilia Carr, accused her Dad of sexual abuse, AND he was convicted of plotting to kill HER years later as a result; the jury gave little weight to either issue. If Casey Anthony is convicted, and especially if she is sentenced to die by lethal injection, Emilia will be Casey’s new *muffin*.. flush. I would like to point out that none of these murders were that of a helpless 34 month old at the hands of her own Mother, which in many Floridians minds, is the worst of the worst. 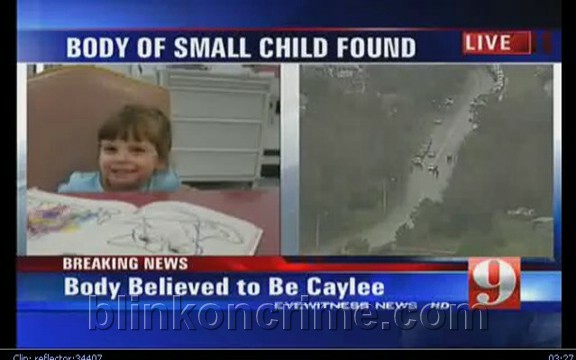 Twelve Jurors, seven women and five men, unless one of 5 alternates is needed, will decide the fate of Casey Anthony. 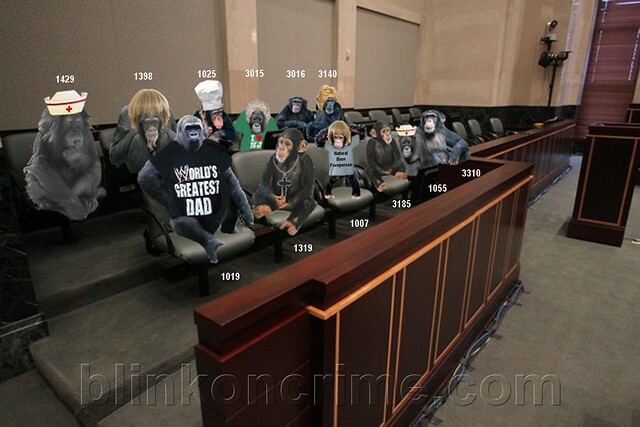 Depicted affectionately below as monkeys, in dedication to our sister site and forum www.scaredmonkeys.net, but most importantly, to the families living without them so they may serve justice on behalf of Caylee Anthony, www.blinkoncrime.com salutes you today. Opening arguments begin at 9AM. Without question, outside of deliberation, this is the most important day of this trial. 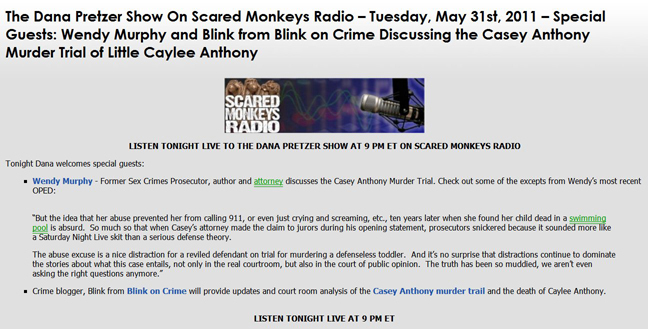 Blink, along with Diane Dimond, will be discussing the first day’s events on The Dana Pretzer Show, Scared Monkeys Radio at 9PM EST. Live link will be posted here one hour before the show.